The Larkspur community is located near the Skyland Golf Course off of Brush Creek Road, roughly two miles from downtown Crested Butte (see map below). This newer subdivision is a great example of a development done “the right way”, and a tour of the area leaves a great first impression. 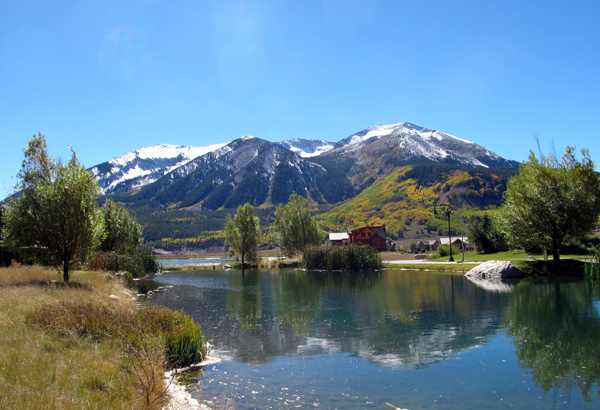 Two beautiful lakes and landscaping highlight the impressive views of Whetstone Mountain, Paradise Divide, and the backside of Crested Butte Mountain. Some of the best lots in the neighborhood are waterfront properties, with Larkspur Lake in the backyard. Other amenities in this neighborhood include a playground and tennis courts, with potentially more once the neighborhood is more fully built-out. The hiking and biking opportunities in the Brush creek area are nearly endless, with national forest access a short distance away. The Robert Trent Jones Jr golf course at Skyland is just a short walk, drive, or bike ride down the street. The town of Crested Butte is two miles away, and the recreation path makes biking or hiking into town a breeze. This same path is groomed in the winter, so you can nordic ski into town as well. The skiing at Crested Butte Mountain Resort is roughly 10 minutes away during the winter months. For more information regarding Larkspur, or if you are interested in selling your Larkspur property, contact me anytime.